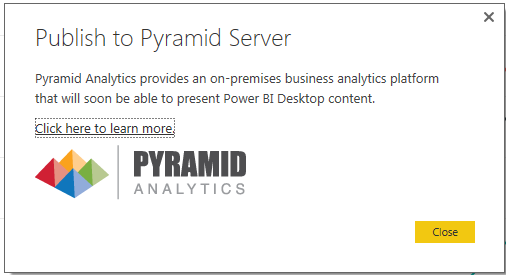 I wanted to make a quick posting on my (still-ongoing) attempt to push Power BI Services to my large organization but having to deal with my organization’s apprehension to the cloud and desire to have Power BI On-Premises. * Note: I will update when I have more information on the options below. There are tons of large organizations (and I would dare say medium and small organizations) that have this apprehension. The cloud! Look what happened with celebrity photos on iCloud and the data breaches that occur with major credit cards so often! According to the Microsoft road map, what looks to be sometime after SQL 2016 general release, we will have the option to publish Power BI Desktop files to SQL Server Reporting Services. Does this include SSRS in SharePoint integrated mode? What version of SharePoint….will it only be in SharePoint 2016 and beyond? Will it take the Power BI local model and create an SSAS Tabular data model on the back end? What features will be available on-premises? Create a new report via web? Content packs? For that matter, will SSRS utilize the idea of Organizational Content Packs? What mobile capability will there be? Will it still have the QR Code Scanning capability? So, the thought here is to utilize Power BI Services only to interface on-premises data sources for a hybrid environment. This would appease the apprehension of management as data would not be in the cloud from their point of view. We need more DirectQuery data sources (i.e. Teradata, Oracle, etc.) to be made available via the cloud. There is no current method of restricting users from utilizing a Personal Gateway and/or Enterprise Gateway. We need this capability. Perhaps we could set firewall rules to disallow any internal PC besides our designated Enterprise Gateway server? There is no current method to restrict users from importing their own data. Restricting this goes against my beliefs of the power and promise of Power BI but would appease that apprehension we are speaking of. I would want the capability to restrict that capability and then turn it on when the masses revolted to management and forced their hand as they saw the benefits of true self-service. Does Quick Insights work with on-premises data sources (will test)? This sounds like it would give us a viable alternative until we reach that point of “beyond 2016”. This was announced on July 23rd, 2016. As of today, it is still not released. The button to publish to Pyramid is there but still says “coming soon”. cannot create a new report via web. What mobile capability will there be? Would assume it to be utilizing Pyramid’s mobile application and therefore, not have the QR Code Scanning capability. Obviously, Microsoft listens to its consumers and there is a large request for this capability. As well, they probably know the numbers that would come with large organizations that are apprehensive about the cloud utilizing Power BI on-premises. It would be huge. So for now, we are at a wait-and-see moment…..what is next for a truly hybrid environment and what are the trade-offs? Is a true Power BI On-Premises with all of the current features a fairy tale?